Calcium phosphate dibasic anhydrous, microcrystalline cellulose, maize starch, povidone K25, polaxamer 407, colloidal silicon dioxide (Aerosil 200), magnesium stearate, polyplasdone XL. 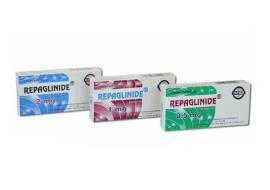 Repaglinide is given preprandially and is titrated individually to optimise glycaemic control. In addition to the usual self-monitoring by the patient of blood and/or urinary glucose, the patient&#s blood glucose must be monitored periodically by the physician to determine the minimum effective dose for the patient. Glycosylated haemoglobin levels are also of value in monitoring the patient&#s response to therapy. Periodic monitoring is necessary to detect inadequate lowering of blood glucose at the recommended maximum dose level (i.e. primary failure) and to detect loss of adequate blood glucose-lowering response after an initial period of effectiveness (i.e. secondary failure). The dosage should be determined by the physician, according to the patient&#s requirements. The Recommended Starting Dose is: 0.5 mg. One to two weeks should elapse between titration steps (as determined by blood glucose response). No clinical studies have been conducted in patients > 75 years of age. Repaglinide is not affected by renal disorders. In debilitated or malnourished patients, the initial and maintenance dosage should be conservative and careful dose titration is required to avoid hypoglycaemic reactions. Patients can be transferred directly from other oral hypoglycaemic medicinal products to Repaglinide. However, no exact dosage relationship exists between repaglinide and the other oral hypoglycaemic medicinal products. The recommended maximum starting dose of patients transferred to Repaglinide is: 1 mg given before main meals. Repaglinide can be given in combination with metformin, when the blood glucose is insufficiently controlled with metformin alone. In this case, the dosage of metformin should be maintained and Repaglinide administered concomitantly. The starting dose of Repaglinide is: 0.5 mg, taken before main meals; titration is according to blood glucose response, as for monotherapy. Doses are usually taken within 15 minutes of the meal, but time may vary from immediately preceding the meal to as long as 30 minutes before the meal (i.e. preprandially 2, 3, or 4 meals a day). Patients who skip a meal (or add an extra meal) should be instructed to skip (or add) a dose for that meal. In the case of concomitant use with other active substances refer to Warnings and Precautions and Drug Interactions, to assess the dosage. Hypersensitivity to repaglinide or to any of the excipients. Repaglinide should only be prescribed, if poor blood glucose control and symptoms of diabetes persist despite adequate attempts at dieting, exercise and weight reduction. When a patient stabilized on any oral hypoglycaemic medicinal product is exposed to stress such as fever, trauma, infection or surgery, a loss of glycaemic control may occur. At such times, it may be necessary to discontinue Repaglinide and treat with insulin on a temporary basis. The use of Repaglinide might be associated with an increased incidence of acute coronary syndrome (e.g. myocardial infarction). Repaglinide should be used with caution or be avoided in patients receiving medicinal products which influence Repaglinide metabolism. If concomitant use is necessary, careful monitoring of blood glucose and close clinical monitoring should be performed. In vitro data indicate that repaglinide is metabolised predominantly by CYP2C8, but also by CYP3A4. Clinical data in healthy volunteers support CYP2C8, as being the most important enzyme involved in repaglinide metabolism with CYP3A4 playing a minor role, but the relative contribution of CYP3A4 can be increased if CYP2C8 is inhibited. Consequently metabolism, and by that clearance of repaglinide, may be altered by substances which influence these cytochrome P-450 enzymes via inhibition or induction. Special care should be taken when inhibitors of both CYP2C8 and 3A4 are co-administered simultaneously with Repaglinide. Co-administration of gemfibrozil (600 mg twice daily), an inhibitor of CYP2C8, and repaglinide (a single dose of 0.25 mg) increased the repaglinide AUC 8.1-fold and Cmax 2.4-fold in healthy volunteers. Half-life was prolonged from 1.3 hr to 3.7 hr, resulting in possibly enhanced and prolonged blood glucose-lowering effect of repaglinide, and plasma repaglinide concentration at 7 hr was increased 28.6-fold by gemfibrozil. The concomitant use of gemfibrozil and Repaglinide is contraindicated. Co-administration of trimethoprim (160 mg twice daily), a moderate CYP2C8 inhibitor, and repaglinide (a single dose of 0.25 mg) increased the repaglinide AUC, Cmax and t½ (1.6-fold, 1.4-fold and 1.2-fold, respectively) with no statistically significant effects on the blood glucose levels. This lack of pharmacodynamic effect was observed with a sub-therapeutic dose of repaglinide. Since the safety profile of this combination has not been established with dosages higher than 0.25 mg for repaglinide and 320 mg for trimethoprim, the concomitant use of trimethoprim with Repaglinide should be avoided. If concomitant use is necessary, careful monitoring of blood glucose and close clinical monitoring should be performed. Rifampicin, a potent inducer of CYP3A4, but also CYP2C8, acts both as an inducer and inhibitor of the metabolism of repaglinide. Seven days pre-treatment with rifampicin (600 mg), followed by co-administration of repaglinide (a single dose of 4 mg) at day seven resulted in a 50% lower AUC (effect of a combined induction and inhibition). When repaglinide was given 24 hours after the last rifampicin dose, an 80% reduction of the repaglinide AUC was observed (effect of induction alone). Concomitant use of rifampicin and Repaglinide might therefore induce a need for Repaglinide dose adjustment which should be based on carefully monitored blood glucose concentrations at both initiation of rifampicin treatment (acute inhibition), following dosing (mixed inhibition and induction), withdrawal (induction alone) and up to approximately two weeks after withdrawal of rifampicin where the inductive effect of rifampicin is no longer present. It cannot be excluded that other inducers, e.g. phenytoin, carbamazepine, phenobarbital, St John&#s wort, may have a similar effect. The effect of ketoconazole, a prototype of potent and competitive inhibitors of CYP3A4, on the pharmacokinetics of repaglinide has been studied in healthy subjects. Co-administration of 200 mg ketoconazole increased the repaglinide (AUC and Cmax) by 1.2-fold with profiles of blood glucose concentrations altered by less than 8% when administered concomitantly (a single dose of 4 mg repaglinide). Co-administration of 100 mg itraconazole, an inhibitor of CYP3A4, has also been studied in healthy volunteers, and increased the AUC by 1.4-fold. No significant effect on the glucose level in healthy volunteers was observed. In an interaction study in healthy volunteers, co-administration of 250 mg clarithromycin, a potent mechanism-based inhibitor of CYP3A4, slightly increased the repaglinide (AUC) by 1.4-fold and Cmax by 1.7-fold and increased the mean incremental AUC of serum insulin by 1.5-fold and the maximum concentration by 1.6-fold. The exact mechanism of this interaction is not clear. In a study conducted in healthy volunteers, the concomitant administration of repaglinide (a single dose of 0.25 mg) and ciclosporin (repeated dose at 100 mg) increased repaglinide AUC and Cmax about 2.5-fold and 1.8-fold, respectively. Since the interaction has not been established with dosages higher than 0.25 mg for repaglinide, the concomitant use of ciclosporin with Repaglinide should be avoided. If the combination appears necessary, careful clinical and blood glucose monitoring should be performed. In an interaction study with healthy volunteers, co-administration of deferasirox (30 mg/kg/day, 4 days), a moderate inhibitor of CYP2C8 and CYP3A4, and repaglinide (single dose, 0.5 mg) resulted in an increase in repaglinide systemic exposure (AUC) to 2.3-fold (90% CI [2.03-2.63]) of control, a 1.6-fold (90% CI [1.42-1.84]) increase in Cmax, and a small, significant decrease in blood glucose values. Since the interaction has not been established with dosages higher than 0.5 mg for repaglinide, the concomitant use of deferasirox with Repaglinide should be avoided. If the combination appears necessary, careful clinical and blood glucose monitoring should be performed. The following substances may reduce the hypoglycaemic effect of Repaglinide: Oral contraceptives, rifampicin, barbiturates, carbamazepine, thiazides, corticosteroids, danazol, thyroid hormones and sympathomimetics. There are no studies of repaglinide in pregnant women. Repaglinide should be avoided during pregnancy. There are no studies in lactating women. Repaglinide should not be used in lactating women. Repaglinide has no direct influence on the ability to drive and use machines but may cause hypoglycaemia. Based on the experience with repaglinide and with other hypoglycaemic medicinal products, the following adverse reactions have been seen: Frequencies are defined as: Common (≥1/100 to <1/10); Uncommon (≥1/1,000 to <1/100); Rare (≥1/10,000 to <1/1,000); Very rare (<1/10,000) and Not known (cannot be estimated from the available data). Not known: Hypoglycaemic coma and hypoglycaemic unconsciousness. * See section Description of selected adverse reactions below. Repaglinide has been given with weekly escalating doses from 4-20 mg four times daily in a 6-week period. No safety concerns were raised. As hypoglycaemia in this study was avoided through increased calorie intake, a relative overdose may result in an exaggerated glucose-lowering effect with development of hypoglycaemic symptoms (dizziness, sweating, tremor, headache, etc.). Should these symptoms occur, adequate action should be taken to correct the low blood glucose (oral carbohydrates). More severe hypoglycaemia with seizure, loss of consciousness or coma should be treated with intravenous glucose. Pharmacotherapeutic group: Drugs used in diabetes, other blood glucose lowering drugs, excl. insulins. Repaglinide closes ATP-dependent potassium channels in the β-cell membrane via a target protein different from other secretagogues. This depolarises the β-cell and leads to an opening of the calcium channels. The resulting increased calcium influx induces insulin secretion from the β-cell. One epidemiological study suggested an increased risk of acute coronary syndrome in repaglinide-treated patients as compared to sulfonylurea- treated patients. Repaglinide is eliminated rapidly within 4-6 hours from the blood. The plasma elimination half-life is approximately one hour. After a 5-day treatment of repaglinide (2 mg x 3/day) in patients with a severe impaired renal function (creatinine clearance: 20-39 ml/min. ), the results showed a significant 2-fold increase of the exposure (AUC) and half-life (t1/2) as compared to patients with normal renal function. Repaglinide Tablets: Carton box containing 1, 2 or 3 strips of 10 tablets each.